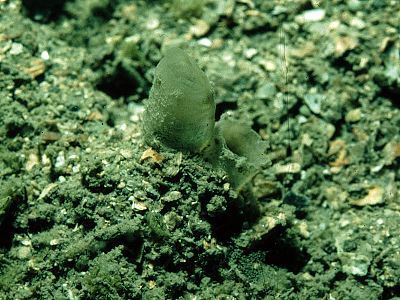 Description: This solitary ascidian is found buried in coarse gravel, sand or muddy sand with only the siphons visible. The siphons are delicate, nearly transparent when extended and tapered. They are placed close together on the uppermost part of the rounded body. The test is covered with firmly attached gravel or shell particles. Habitat: Sheltered or semi-sheltered sites with muddy gravel or muddy sand substrata. Distribution: Common and often abundant in suitable habitats all round the British Isles. Similar Species: Molgula oculata is a similar but larger species which has a characteristic bare area around and between the siphons when it is expanded. It lives in clean coarse gravel or shell gravel. Eugyra arenosa is also similar but lives in clean fine sand and has a test covered in sand particles. Picton, B.E. & Morrow, C.C. (2016). Molgula occulta Kupffer, 1875. [In] Encyclopedia of Marine Life of Britain and Ireland.